New cloud app capabilities offer the potential for teams to work smarter and more efficiently than ever before, but they can put huge pressure on IT and security teams to ensure company data remains secure without hindering forward progress. Microsoft 365 tools allow you to do this. Picture this: your sales team leader excitedly tells you about their new plan to use cloud apps and the latest devices to become more mobile and better reach clients. As the security advisor, your first thought is that more endpoints mean more risk for data security. With the tools from Microsoft 365, you don't have to stress anymore. 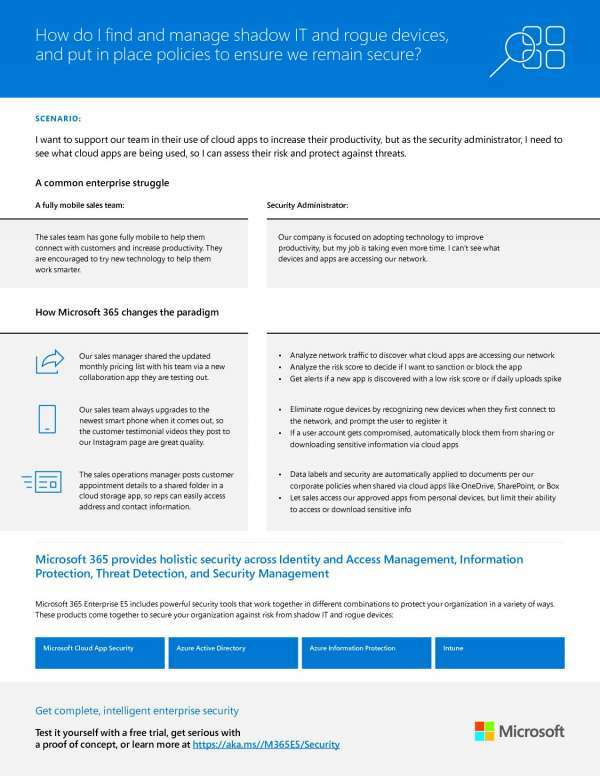 You can analyze the risk of each app used, monitor for login attempts from suspicious devices, and protect sensitive data wherever it travels--all through Microsoft 365. Don't let security concerns stand in the way of progress. Give your IT team the tools they need to help the rest of your business thrive.